An ad for Wheat Hearts appeared in the August 12, 1909 Ypsilanti Daily Press. Ypsilanti once had a chance of becoming an empire of breakfast cereals, like Battle Creek. In 1909, electricity was still making inroads into the city. Only some houses were “wired.” Most were heated with coal. Cars were uncommon. Most women were homemakers, and most men’s commute consisted of a walk from home to another part of the city. “The Ypsilanti Mill is now running and turning out a STRICTLY HIGH GRADE FLOUR. “Our BLUE LABEL brand is gaining new friends every day. Last week it was just a youngster. This week it is older and you will probably like it better. “Further, we want you to try our ‘TIDAL WAVE’ brand. It’s a strictly high class patent and worthy of a little assistance from its friends in the way of trial orders. “We have on hand BRAN MIDDLINGS, COTTON SEED MEAL, LINSEED MEAL, CALF MEAL, WHEAT HEARTS and GRAHAM. The hydro-powered mill was an old one, dating from the 1830s. A feature article in the May 23, 1874 Ypsilanti Commercial gave an overview of the city businesses of the time. The piece mentions the city mill. “[The mill stands] on the east bank of the Huron, above Cross Street bridge. It, or rather the mill of which this is an enlargement, was built in Territorial days [before Michigan became a state in 1837]. In 1865 it came into the possession of the Ypsilanti Woolen Mill Company, and by this company was sold to T. C. Owen, Esq., a nephew of E. B. Ward of Detroit, who is also an interested party. The mill is an immense structure. It contains seven run of stone, and at present is turning out 250 barrels of flour per day. It, in addition, grinds 30,000 bushels of grain per year, for the farmers of the vicinity. . . A side track from the Michigan Central Railroad runs to the door of the mill.” The side track ran approximately where Rice Street is today. As we are marching on. When summer days are long. 1909 was a good year for local wheat production. The Ypsilanti Milling Corporation decided to put some of that wheat into a new venture. It milled it into a breakfast gruel similar to Cream of Wheat. On August 6, 1909 the first ad for “Wheat Hearts” appeared. “What are they? Well, we’ll tell you. They are our new breakfast food made from the very best wheat grown; viz, that around Ypsilanti, and ground fresh every day. Why buy breakfast foods made away from home when you can get something here which you know is fresh and which will cost you less money. Ask your grocer for Wheat Hearts. The ad ran again on August 10, 12, and 16. Several local grocers also ran ads during that summer, often listing their goods and specials in the ads. Some listed oatmeal and cornflakes. None listed Ypsilanti Wheat Hearts. The Ypsilanti Milling Company’s ads for Wheat Hearts vanished by September of 1909. Perhaps no one wanted a hot breakfast gruel in August. Possibly a fall launch of the cereal might have helped it to succeed. At any rate, Wheat Hearts vanished from the scene. The Ypsilanti Historical Museum holds no packaging artifacts of this forgotten cereal. Alas, it wasn’t to be. Wheat Hearts vanished from the 1909 papers and presumably from local stores—if indeed it had ever been stocked. The only people who remember our failed foray into the breakfast cereal arena are local hermits poring over crumbling newspapers. And they’re no help in promoting Wheat Hearts. They usually have just a miserly cup of coffee—black, no sugar—for breakfast. Laura Bien is the author of “Tales from the Ypsilanti Archives.” Catch her free talk with local historianJames Mann at Ypsilanti’s Senior Center Wednesday, July 7 at 7:30 p.m.. Have an old-time Ypsi story? Contact Laura at ypsidixit@gmail.com. 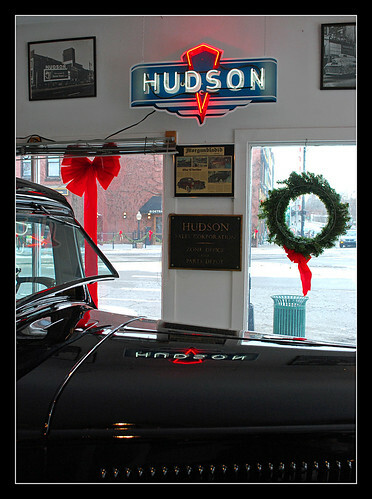 founded by Jack Miller, who’s Father started this dealership. Jack was manning the front desk when we visited on New Year’s Eve. Blend meat, rice pepper, celery salt, onions. Form into 24 balls. Place in baking dish; add soup, tomato sauce, and water. Cover and bake in slow oven (325 degrees) for 1 1/4 hours. Stir together Jello and water until jello is dissolved; cool. While Jello mixture is cooling, in mixing bowl combine remaining ingredients. Mix with mixer on medium speed for 2 minutes. Add the cooled jello-water mixture. Mix until well blended. Pur batter into greased and lightly floured angel food cake pan or Bundt pan. Bake at 350 degrees for 30-35 minutes. Remove from oven and poke holes in top of cake. Pour glaze over cake while hot. Mix together until smooth and pour over hot cake. If the AWOL iguana is not claimed, perhaps there is a new belt or a pair of boots in Mr. Pierce’s future. According to Pierce, the iguana’s owner has been found. The owner was able to ID “Marissa” from pictures. Marissa has been missing since May 28, 2010 and began her journey in the Normal Park area. To make her way to Ypsilanti’s south side neighborhood, she would’ve had to cross busy Michigan Avenue. Well done, Marissa! Although the iguana’s owner has been found, the iguana herself has eluded capture so far. Apparently it’s not easy to track a green iguana in a green tree. YpsiNews.com does not anticipate CNN trucks lining the streets and doubts Nancy Grace will be reporting from Ypsilanti. However, a small volunteer watch has been formed to locate Marissa. YpsiNews.com will keep you posted on the Great Ypsilanti Iguana Hunt. If you happen to spot “Marissa”, please contact YpsiNews.com and be informed that Marissa likes cream cheese. It Takes A Town To Make A Video – How Was I To Know? MacGregor sent out emails and used his connections with local Ypsilanti talent to set things in motion. He said, “I could see it in my head, and once I could do that, I knew I could make it happen in the real world…or at least on camera.” Ken contacted videographer Scott Hatkow, who agreed to work pro bono saying, “I’ve always wanted to do a music video.” MacGregor also called upon Kelly Jean Passage, the female lead in a zombie horror / comedy he’ll be shooting this summer. Passage loved the song and was enthusiastic about being in the video. Matthew Fulton, a buddy from high school, now a Kung Fu instructor happily agreed to choreograph the fight scenes. A recording session was scheduled, filming locations were confirmed and they were ready to go. The gym scene was shot at Ypsi Studio, a small fitness and wellness center in Ypsilanti on Michigan Avenue. Julia Collins, the owner, donated the use of the space and agreed to fill in as an extra. MacGregor also called in Dave Rahbari at the last minute as an extra-extra-extra playing three different parts. The final location was Haab’s Restaurant, an Ypsilanti landmark. There, the production was aided by a very helpful staff, including the bartender who made the actors fake cocktails to drink. The video went up on YouTube on June 1, and is already closing in on 1,000 hits. YouTube has begun putting ads on the video, which can be assumed means they think it’s doing pretty well. It’s definitely a positive statement about the local talent in Ypsilanti. WATCH VIDEO: How Was I To Know? On June 26, Ypsilanti’s Depot Town will be invaded by possibly 1,000 motorcycles. It’s the welcome and friendly invasion of The Ton-Up Motorcycle Show and Music Festival. Parts of Cross and Rice Streets will be closing for the event which will feature motorcycles and scooters of all types from all eras, with a focus on vintage bikes. Cafe’ Racer at 10 Cross Street acts as “Mission Control” for the free festival. There will be live music on stage from noon to 11pm with a lineup of local musicians such as The Reefermen, Ypsitucky Colonels and Rattlebox. A beer tent will be set up and motorcycle accessories & parts will be available from vendors. During The Ton-Up Motorcycle & Music Festival, Cafe’ Racer is holding a contest to find a model to grace a page of their 2011 Pin-Up calendar. Contestants will model vintage 40s, 50s, & 60s pin-up attire. Ton-Up is a British term that refers to a motorcycle capable of speeds of 100mph or more. Organizers expect between 2,500 and 3,000 people to attend this first-time event. To find out more about this event, sponsorship opportunities, the pin-up competition, or to register your bike for the show, visit The Ton-Up Web site at http://thetonup.intuitwebsites.com. “The Girl in Centerfield,” a feature-length documentary produced by Detroit-based Stunt3 Multimedia, is the story of Carolyn King’s fight to play Little League baseball. Using interviews, stock footage, and re-creation, Stunt3 will weave together the drama of the summer of 1973 when the nation watched as the city of Ypsilanti went head-to-head with Williamsport, Pennsylvania and the institution of Little League Baseball. The film is scheduled for release in the summer of 2010. On Thursday, July 19, 2010, 7-8:30pm Ypsilanti District Library will premiere the trailer for the documentary and host a personal appearance by Carolyn King Minot. Ypsilanti Ladies, Take The Field! Eastern Michigan University is offering “Football 101” – a skills clinic for women Saturday, July 24, 2010 from 10 am-3 pm. Participants will experience what it’s like to be a player as coaches teach them the importance of different positions and run them through practice drills. At the end of the day, they will have the basic knowledge and skills needed to enjoy the game of football. Registration for the event is $30 per person ($15 for EMU students) which includes lunch, a “Football 101” t-shirt, and photo opportunities with Head Coach Ron English. Each participant will also receive a season ticket to the 2010 EMU Football season. Additionally, for each Football 101 registration, $5 will be donated to support EMU Volleyball’s “Dig Pink” fundraiser to benefit breast cancer research, which will take place in the fall. For more information about the EMU Football 101 Skills Clinic, call 734.487.8109 or visit EMUEagles.com. Meetings are generally monthly (currently on Thursday evenings), and terms are four years. Adults and high-school aged youth are both welcome to serve. Interested citizens should contact Mayor Schreiber at mayor@cityofypsilanti.com to discuss their interest in being considered for an appointment. The Mayor will take multiple factors into consideration, and interest in the position will not necessarily lead to an appointment at this time.